Crystal Petrini is the Financial Analyst at the University of California Institute for Mexico and the United States (UC MEXUS) and has been serving the UC system since 2013. In her role, she assists with budgeting, financial reporting and the tracking of financial results. She is responsible for the UC MEXUS Director’s research and grant management and serves as an expert intermediary between the Institute and CONACYT, Mexico’s equivalent of the National Science Foundation. 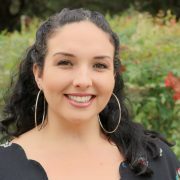 Crystal received her MBA in Global Business from the University of Redlands and holds dual BAs in Political Science: International Relations and Spanish from UC Santa Barbara. In 2018, she was elected to UC Riverside’s Staff Assembly as President-Elect and is excited to join CUCSA as a junior delegate so that she can help improve the lives of staff throughout the UC system. Crystal is passionate about supporting and encouraging staff through building strong working relationships, improving policies and processes, and incorporating healthy habits into the fabric of work life so that every individual can most effectively serve their campus community.